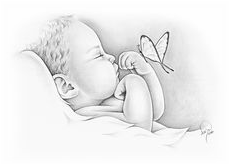 An angel came to us on March 30, 2019, we all welcomed our little angel, but some how our angel was taken back. She was born to Marlysia Bigback and Brent Ryan. Kyleah is survived by her mother. She would have all kinds of aunts that would love her and welcome her: Verna (Chilo) Rivas, Cheryl (Merlin) Limpy, Ramona Bullcoming, Ida (Robbie) Onebear, Irene Bullcoming, Lattona (Vincente) Puente, Carol (Randy) Gordon, April Limpy and boys, Destiny (Cory) Limpy; special uncle, Koan Komas, Bailey Limpy, Zyler Onebear, Merlin Limpy Jr.; great-grandfather, Vernon Wyatt Bullcoming, whom had passed on with his great-granddaughter. She is survived by her mother, grandmother, Irene Bullcoming; grandfather, Robert and Cheyne Bigback; brother, Kylynn; great-grandmother, Rhoda Bullcoming and Adeline Spottedelk; great-grandfather, Wesley (Bonnie) Spotted Elk. She comes from a large family, Bullcomings, Bigbacks, Chief Littlewolf and Spottedelks.